The Fortnite Week 10 Challenges are live, and mark the final full week of the seasonal event. In this complete Fortnite Week 10 Challenges guide, we’ll be detailing how you can quickly and easily complete the full list of seven challenges for the week, earning as many Battle Stars as possible. 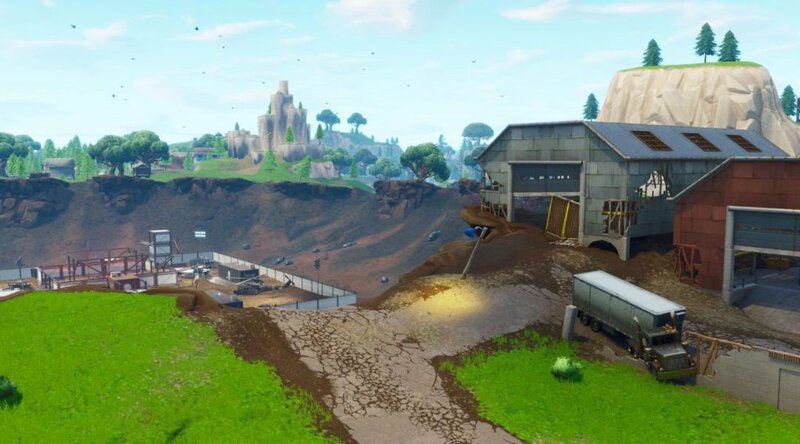 But as we mentioned just above, we’re now well and truly into the final week of Fortnite Season 5. For a complete guide to everything we know so far about the next upcoming seasonal event in Battle Royale, including the projected start date and leaked skins, head over to our Fortnite Season 6 guide. As per usual, the Fortnite Week 10 Challenges all launched right around 6 am PT/9 am ET, on September 14. If you need a guide to the previous week’s tasks, head over to our Fortnite Week 9 Challenges guide. But for this week in Fortnite, you can check out the complete list of the Week 10 Challenges just below. As always, these leaked challenges from earlier in the week came from FortniteTracker, an incredibly reliable source of Fortnite information ahead of time. 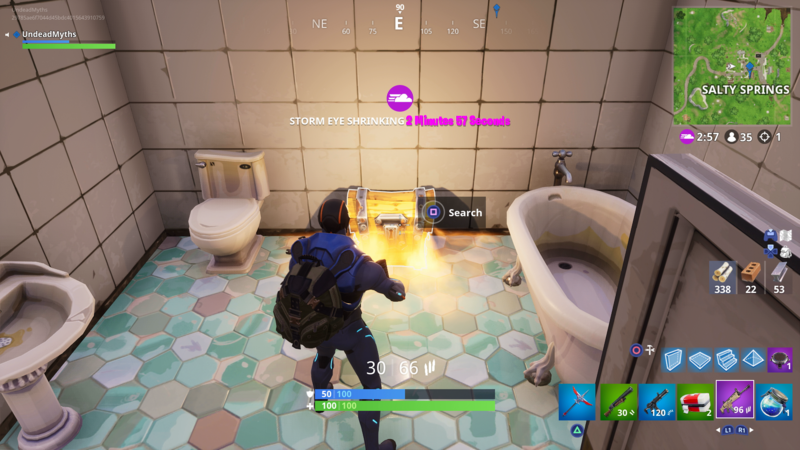 All the Puzzle Pieces have only just been implemented in Fortnite Battle Royale, and they can be found in basements across the map. For a full list of these locations, head over to our Fortnite Jigsaw Puzzle Pieces guide. 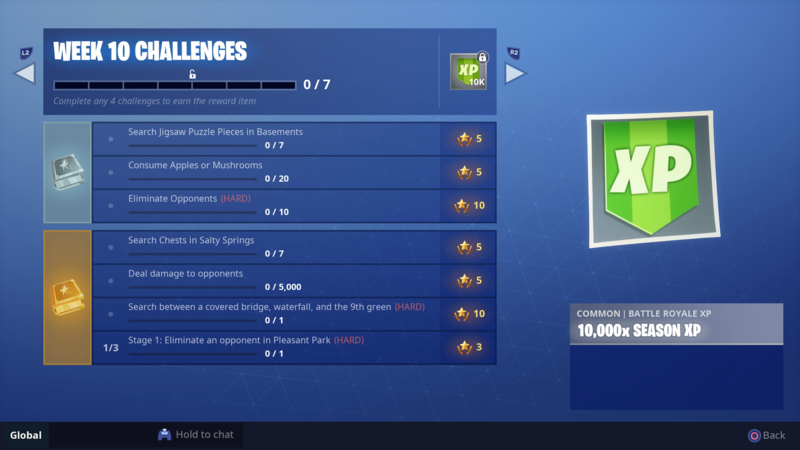 There was a challenge previously in Fortnite Season 5 which tasked us to eat a certain number of Mushrooms, but this challenge includes both Apples and Mushrooms. 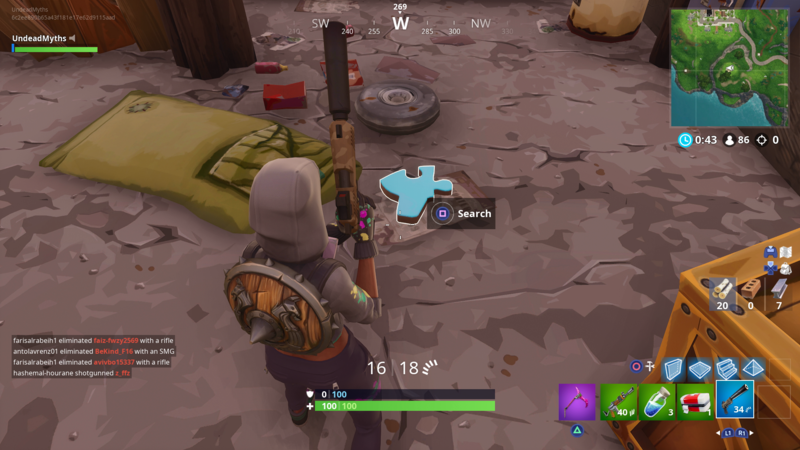 If you land near Dusty Divot or Junk Junction, it shouldn’t be too difficult to rack up 20 of either item eaten before the season ends. Eliminating one opponent is easy, but eliminating ten opponents could be a bit tricky, especially if you’re not planning on playing Fortnite Battle Royale a great deal before Season 5 draws to a close. 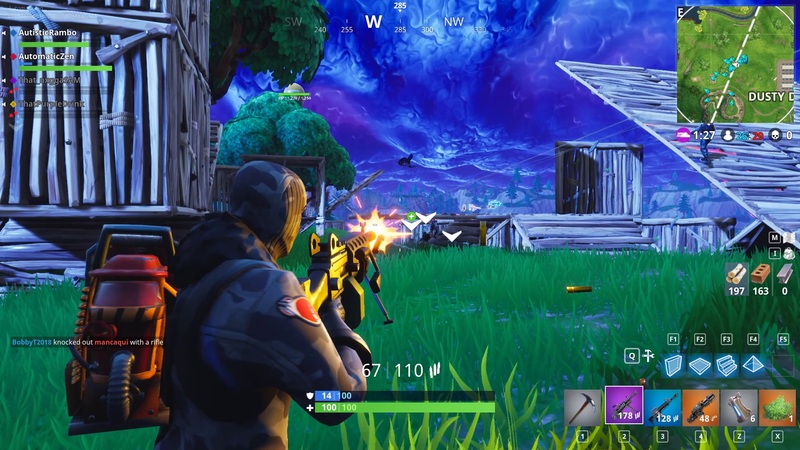 If you recognise this challenge somewhat, that’s because it was a challenge previously in Fortnite Season 4, earlier in the year. 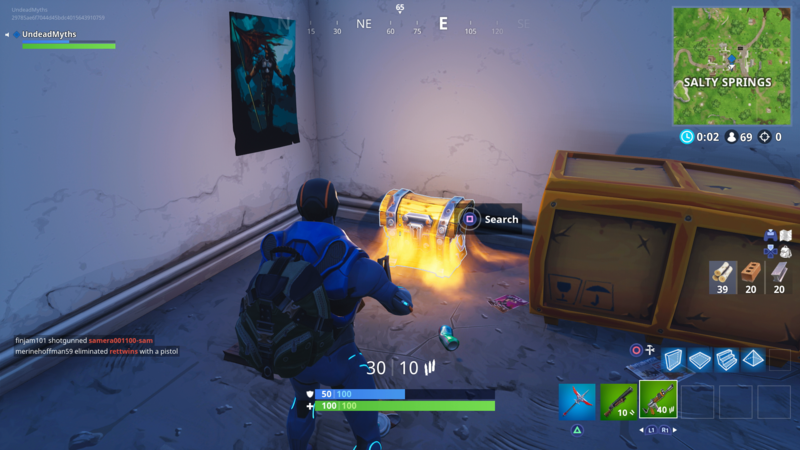 For a full list of all the chests found in this location on the Battle Royale map, head over to our Fortnite Salty Springs chest locations guide. This shouldn’t be too difficult a challenge to complete. Provided you get in enough games of Fortnite before Season 5 draws to a close, 5,000 points worth of damage to opponents definitely isn’t an impossible feat. This is basically the ‘treasure’ challenge of the week, where we’ll have to roam around the Fortnite map in search of the precise spot between all three landmarks on the map. For a complete walkthrough of the final location of the hidden Battle Star, head over to our Fortnite Week 10 Treasure Challenge guide. We might now be all wrapped up with this particular Fortnite guide on the Week 10 Challenges, but as we mentioned previously, make sure to check back on this guide later in the week. For now though, you can head over to our best Fortnite skins page, which we’ll be updating as soon as Season 6 launches. This article may contain links to online retail stores. If you click on one and buy the product we may receive a small commission. For more information, go here.